A new Web application, Social Collider, visualizes the network of connections created by activity on Twitter. 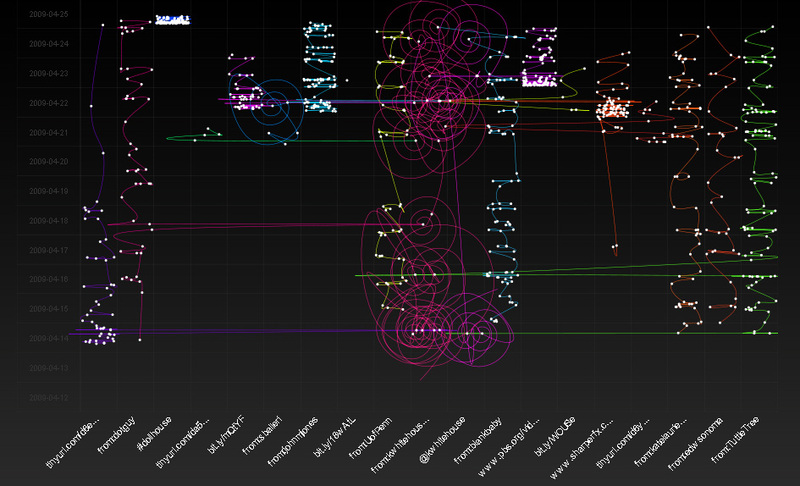 Given a Twitter username, phrase, or a selection from a list of current trends, the application maps points for each tweet and then connects them with b-splines to create an image inspired by the tracks produced by the collision of subatomic particles in a high-energy particle accelerator. For example, using your Twitter username, Social Collider plots your tweets using the date as the vertical axis and the “search query ID” to space the points horizontally. (It’s not clear whether this latter is the tag in the results from search.twitter.com or some other value generated by the application). In adjacent columns the application similarly plots the @-replies, #hashtags, retweets, and URLs from your Twitter stream. The image above (click to see the full version) shows the activity for my Twitter account (@kwhitehouse) over the past two weeks. My tweets are displayed in the middle column (the one in hot pink), with @-replies to me on the right in fuchsia. (As you have no doubt guessed by this point, the application doesn’t let you select the colors it uses to display the Twitter streams.) That’s my Internet-famous friend and erstwhile colleague @blankbaby one column to the right in teal and @UofPenn to the left in green. For more information or to run Social Collider for yourself, go to: http://socialcollider.net/.